With the conclusions of special counsel Robert Muellers probe now known to a significant degree, it seems apologies are in order. Whatever his supposed flaws, the rampant accusations and speculation that shrouded Trumps presidency, even before it began, ultimately have proven unfounded. Just as Trump said all along. Yet, each time Trump said so, some of us in the media lampooned him. We treated any words he spoke in his own defense as if they were automatically to be disbelieved because he had uttered them. Some even declared his words to be lies, although they had no evidence to back up their claims. As such, we reported a tremendous amount of false information, always to Trumps detriment. And when we corrected our mistakes, we often doubled down more than we apologized. We may have been technically wrong on that tiny point, we would acknowledge. But, in the same breath, we would insist that Trump was so obviously guilty of being Russian President Vladimir Putins puppet that the technical details hardly mattered. Apologies to Trump on behalf of those in the U.S. intelligence community, including the Department of Justice and the FBI, which allowed the weaponization of sensitive, intrusive intelligence tools against innocent citizens such as Carter Page, an adviser to Trumps presidential campaign. And now, with those apologies handled  are more than apologies due? Should we try to learn more about those supposed Russian sources who provided false intel contained in the dossier against Trump, Page and others? Should we learn how these sources came to the attention of ex-British spy Christopher Steele, who built the dossier and claimed that some of the sources were close to Putin? Are these the people who actually took proven, concrete steps to interfere in the 2016 election and sabotage Trumps presidency, beginning in its earliest days? Just who conspired to put the dossier into the hands of the FBI? Who, within our intel community, dropped the ball on verifying the information and, instead, leaked it to the press and presented it to the FISC as if legitimate? Sorry hardly seems to be enough. Some people in the media cried when they found out that their president had not conspired with a foreign power to overthrow an American election. Indications are they are not interested in accountability, facts or anything else ethical or logical and are in the process of doubling down on their corruption. Sorry Mueller destroyed lives in the process and he gave the democrats a victory in 2018 that the ‘Rats did not deserve. Don Jr. was just on with Tucker and he was on fire. Sorry is a good start. Pardons for a select few should follow. And investigations are long overdue. Eventually indictments are expected and warranted. They will be sorry when Trump’s 5th year begins! Then Don Jr takes over year 9. If the conspirators are not held to account, this will happen again in 2020. Why wouldn’t they try it again? They’ll just get better at it. S. Attkinson, you just wrote a B.S. piece. Apparently you do not dare to write about the treasonous actvity of the fbi or that it was the Hildbeast & the DNC paid for the Steele dossier. Nor that is was the Clintons that had dealings with Russia on Uranian One and the millions paid to the Clintons. If you cannot come and write about the attempted coup, then you are sugar coating what is happening. Come out and say it; Coup, Treason by the fbi. earliest days [during the election campaign]?" Today was Shemp’s first day back after the Mueller report was handed over. Shemp used to spend the better part of his shows bashing Trump about the collusion and obstruction of justice charges. No matter who was on and what matter was discussed regarding the charges, Trump would always be presented as corrupt and undeserving of the presidency and crooked. After the report, Shemp barely spent 5-10 minutes talking about the finding that, there was no collusion and no obstruction of justice. No doubt that, when democrats launch their new witch-hunts, Shemp will be right there urging the congressional democrats to, GET HIM!!! I would love to have transcripts (and recordings) of all the things both of these two were involved in during the past 14 years. Don Jr. is not eligible to be president; the only child of Donald Trump who is constitutionally eligible to run is Tiffany (Tiffani?). Anyway, political dynasties are poison. There will be some good GOP choices in 2024, and hopefully the democrats will be cleaned up enough by then, that they might proffer a marginally acceptable candidate. 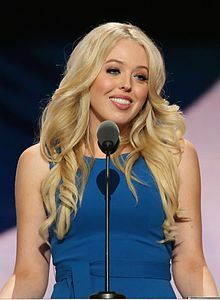 Don Jr. is not eligible to be president; the only child of Donald Trump who is constitutionally eligible to run is Tiffany (Tiffani?). Partner, Special Prosecutor Mueller received from the American Taxpayer $1500 x 40 hours per week x 52 weeks = $3.12 Million Dollars a year plus any overtime for that year. Mueller did this for 2 years and so he earned more than $6.24 Million plus overtime. Special Prosecutor Mueller had 13 DemonRats on his staff and I have a great big question of Why 13 DemonRats who lied thru their teeth and they wanted to probe Collusion????? We have heard that the 13 DemonRat Lawyers were getting paid anywhere from $600.00 per hour up to $1200.00 per hour and it was all paid by the American Taxpayer. These 13 lawyers also had staff to pay and do the work. Partner, I am getting so P.O.ed as I write this painful reply! Robert Mueller's Staff just punch gutted the American Taxpayer for about $50 million dollars a year plus whatever the jokers in the DemonRat party in the House and the Senate. BTW, this amounts to about $100 Million plus a year just from this guy Mueller plus whatever the House and Senate spent. This investigation did not cost $25 Million like they keep saying but around $200 Million plus to find "No Collusion." The DemonRat party does not even care about deficits. Partner, the interesting part is that we have a brand new U.S. Atty. General, which I think will mean that he is going to have a Special Investigation into Brennan, Clapper, Susan Rice, Bruce Ohr, Nellie Ohr, Comey, McCabe, Peter Strozk and his squeeze, McStain (who is dead), Loretta Lynch, Eric Holder, Rosenstein. Actually, the whole Department of Justice is corrupt to the core and the FBI is corrupt to the core. Of course, this was all brought on by the "America Hating Imposter Piece of Work Obama." "Obama really is a "Real Piece of Work." Partner, now if we can just get "The Giant Sixth Grade Journalists" to work for the American populace. That might be a bit too much to ask for reality for a change from our Fake News MSM. He's over 35 and a citizen. a presidential candidate must be a natural born citizen of the United States, a resident for 14 years, and 35 years of age or older. Perhaps Jr. hasn’t been here 14 years unbroken. I’d think that vacations abroad or business dealings in foreign lands would not disqualify a person; would it?